Sherpa / Shire or Solutions tweed cloth is a material used in more applications at Catalina Custom than any other material. It is versatile enough to meet the requirements from the smallest to the largest of projects. Tweed cloth is a very cost effective material while offering good looks, 200+ different combinations of colors, choice of tweed patterns to use together when designing a upholstery project (either solids or combinations of colors with pattern choices) and confidence knowing that a product is being sold that will give a customer years of durability. 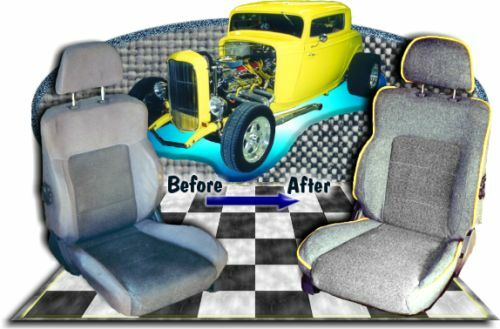 Catalina custom has used this material from designing and building interiors for show winning autos to a matching alternative for foreign automotive cloths to building a nice looking, durable seat for a work truck. Tweeds is also an excellent cloth that can be used for providing a sculptured look on headliners and door panels in show cars and pliable enough to cover moldings if necessary. A Sherpa Gray Heather was chosen for the major pattern (trim color) with Shire Black Marble as the accent cloth to construct the interior of this '32 Ford 3 window coupe. 1985 Mitsubishi bucket seats was used for the seating requirements. The picture on the left shows the seats before and after upholstery. 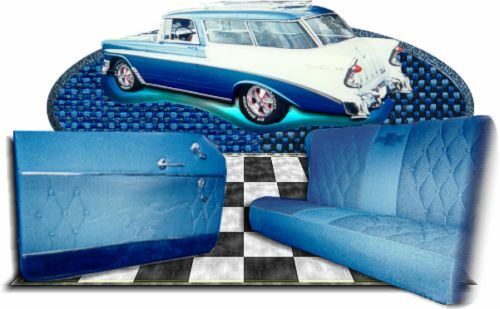 Two different Shire patterns was used to construct the interior of his 1956 Chevy Nomad. This classic, show winning auto uses Shire Twilight (left close-up) as the trim with Shire Midnight as the insert. More illustrations of these and other tweed cloth projects may be viewed in the Showcase Gallery.